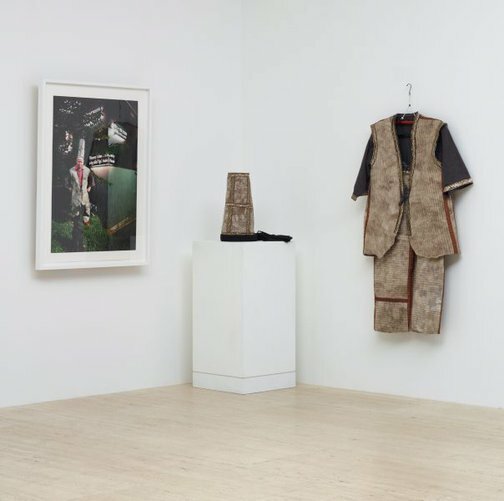 'Joni and Bacon' 2014 is from a series of felt coats and hats displayed alongside photographs of curators and artists wearing the garments, with their pet dogs in tow. 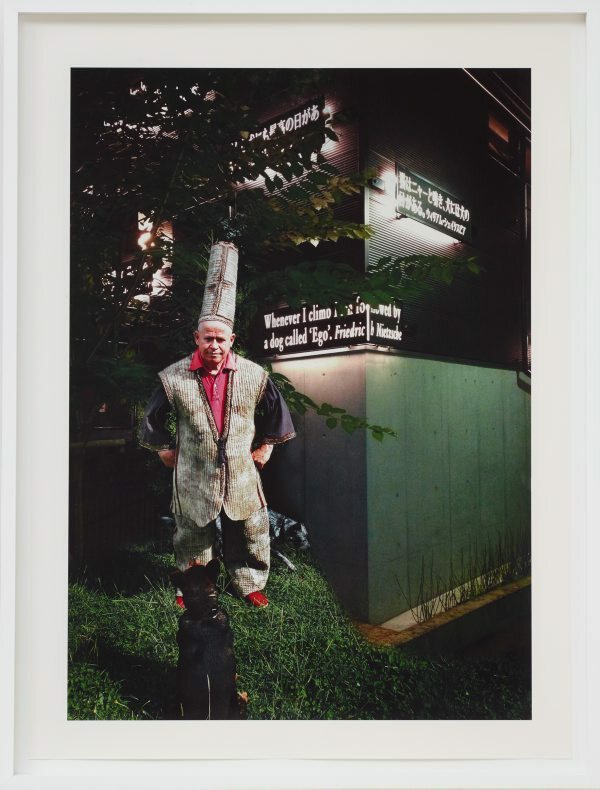 This nature-culture symbolism was inspired by Joseph Beuys' 'Coyote: I like America and America likes me' 1974, a performance in which the artist locked himself in an apartment room for three days with a wild coyote, felt blanket, and wooden staff. Clothing and fashion are of biographical significance to Graham as her mother was a tailor, but also given the artist's connection to the north of England, and the legacy of the region's textile industry. This has inspired Graham to trace networks of female labour and colonial/ corporate power in past works such as 'Canal Street Rubber' 1995 and 'Card' 1995, also held in the collection of the Art Gallery of New South Wales. 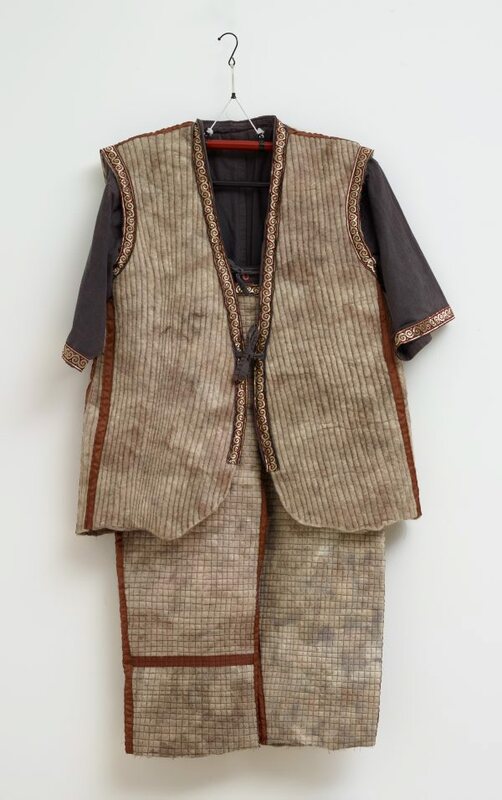 Another key aspect of Graham's practice demonstrated in 'Joni and Bacon' is her interest in utilising by-products of manufacturing, such as animal hair. 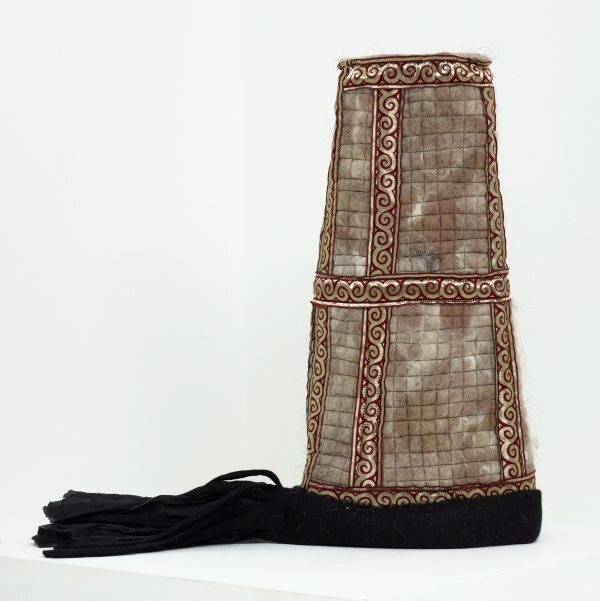 The felt fabric was made by fusing dog fur with merino wool, which has allowed the artist to establish a material connection between object and image, owner and pet. Graham first encountered the material in a Beijing museum, and admired it for its sculptural features. She notes that the 'ceremonial quality' of the clothing indicates a sense of occasion, which further strengthens the subjects' bond with one another (See Janet McKenzie interview with Anne Graham, 'The ability to see things as if for the first time is for me the essential quality necessary to make art' in Studio International, London, Oct 2014). Joni Waka (Johnnie Walker) is director of A.R.T. in Japan. Bacon was an Irish Wolfhound, who died in 2008.